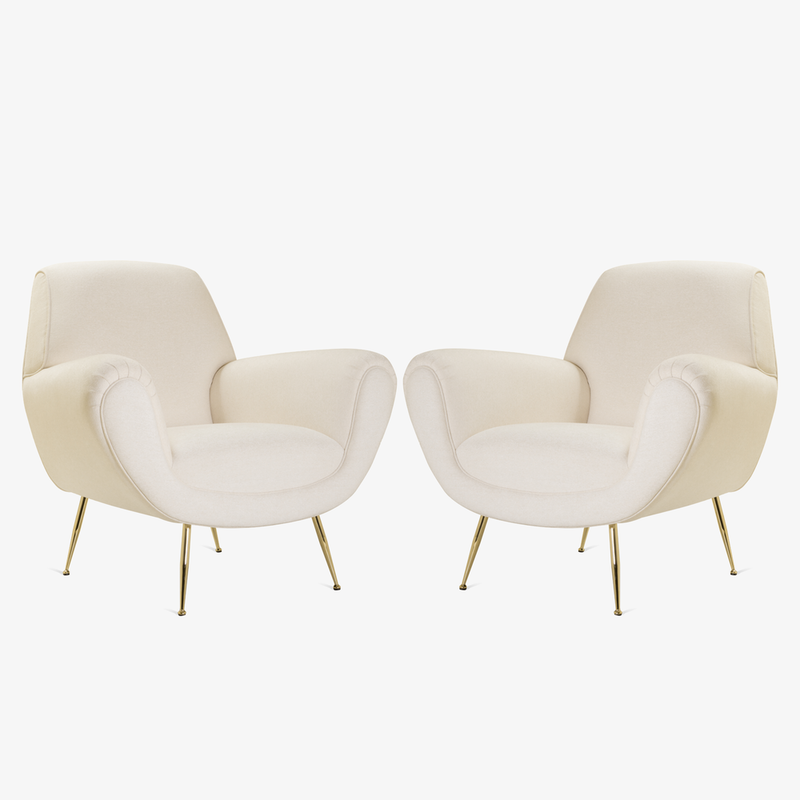 The Montage Workroom has been restoring beloved pieces of design for many years and very quickly these Italian Club Chairs became a favorite, unsurprisingly so. Imported from Italy, these playful chairs designed by Gigi Radice for Minotti received a complete restoration right down to their frames. Every inch of these chairs was touched by our Workroom team ensuring excellence in quality and guaranteed longevity for years to come. Their design is very much Art-Deco in proportion with sweeping lines yet definitive in form. Deep seats and generous arms embrace you while ample support is enjoyed due to new foam throughout each chair. We used a stunning textured fabric, soft to the touch, in a crisp Ivory. The tight seat enables the chairs to keep their shape with ease, they will always look perfect in their setting. As an added touch of luxury, each original vintage brass leg has been stripped and 24k Gold-Plated. Every inch of these chairs has been restored and enhanced to perfection using only the best materials making them an effortless fit into any interior setting. Condition Excellent. Newly restored & upholstered.